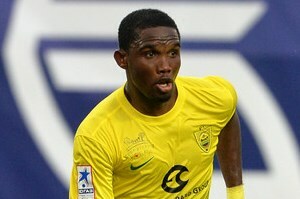 The 32 year old Cameroon international striker has been given permission to leave mega-rich Russian club Anzhi Makhachkala and says it would be an honour to reunite with former Inter Milan boss Mourinho who now has the reins at Chelsea. “There is only one Jose Mourinho,” said the former Mallorca and Barcelona star. “I have played under a lot of great coaches – but there is no other character in the game like Jose.